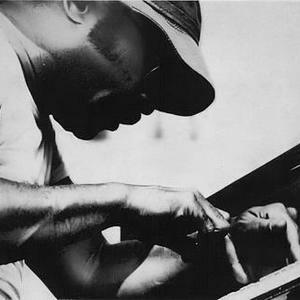 Cecil Percival Taylor (born in New York City March 15 or 25, each date often cited, 1929) is an American pianist and poet now generally acknowledged to be one of the great innovative sources of free jazz (along with the better known Ornette Coleman). His first recording Jazz Advance was released in 1956, and is described by Cook & Morton in the Penguin Guide to Jazz: "While there are still many nods to conventional post-bop form in this set, it already points to the freedoms which the pianist would later immerse himself in". Taylor is known for being an extremely energetic, physical yet subtle player, producing exceedingly complex improvised sounds, frequently involving tone clusters and intricate polyrhythms. At first listen, his dense and percussive music can be difficult to absorb, often described as if playing "88 tuned drums." He learned piano at six and went on to study at New York College and New England Conservatory. After first steps in rhythm and blues and swing-styled small groups in the early '50s, he formed his own band with soprano saxophonist Steve Lacy in 1956. Throughout the 50's and 60's, it was often difficult to find work, despite landmark recordings such as Unit Structures, nefertiti the beautiful one has come, and a pairing with John Coltrane (released as Coltrane Time under John Coltrane's name and as Hard Driving Jazz under Taylor's). Taylor played and recorded heavily with alto saxophonist Jimmy Lyons from 1961 until Lyons' death in 1986, along with drummers Sunny Murray and later Andrew Cyrille. Within that group, known as "The Unit," the musicians developed often volcanic new forms of conversational interplay. From the early 1970s onwards, Taylor began to garner critical, if not popular, acclaim, playing for Jimmy Carter on the White House Lawn, lecturing as an in-residence artist at universities, and eventually being awarded a Guggenheim Fellowship in 1973 and then a MacArthur Genius Award in 1991. Following Lyons' death, Taylor has played in a variety of settings ranging from solo (e.g. Silent Tongues, Indent, For Olim, Garden (parts I & II), Erzulie Maketh Scent, The Tree Of Life, and In Willisau), the "Feel Trio" formed in the early 1990s with William Parker (bass) and Tony Oxley (drums) (Celebrated Blazons, Looking (Berlin Version) Corona, and the 10-cd set 2 Ts for a Lovely T) as well as larger ensembles and big-band projects. His extended residence in Berlin in 1988 was extensively documented by the German label FMP, resulting in a massive boxed set of performances in duet and trio with a 'who's who' of European free improvisers, including Oxley, Derek Bailey, Evan Parker, Han Bennink, Tristan Honsinger, Louis Moholo, Paul Lovens, and others. Most of his recordings for the past several decades have been put out on European labels, with the exception of the unexpected release of Momentum Space (a meeting with Dewey Redman and Elvin Jones) on Verve/Gitanes. The classical label Bridge recently released his 1998 Library of Congress performance Algonquin, a duet with violinist Mat Maneri. Few recordings from 2000 have yet been published, though Taylor, now in his 70's, continues to captivate audiences around the world with live concerts, usually played on his favored instrument, the B?sendorfer piano that features 9 extra lower register keys. A documentary spotlighting the enigmatic musician, "All the Notes", was released on DVD in 2006 by director Chris Felver. In addition to piano, Taylor has always been interested in ballet and dance. His mother, who died while he was still young, was a dancer and also played the piano and violin. Taylor once said: "I try to imitate on the piano the leaps in space a dancer makes". He collaborated with dancer Dianne McIntyre in 1977 and 1979. In 1979 he also composed and played the music for a twelve-minute ballet "Tetra Stomp: Eatin' Rain in Space", featuring Mikhail Baryshnikov and Heather Watts. Taylor is also an accomplished poet, citing Robert Hayden as a major influence. He often integrates his poems into his musical performances, and they frequently appear in the liner notes of his albums. The CD Chinampas, released by Leo Records in 1987, is a recording of Taylor reciting several of his poems unaccompanied.